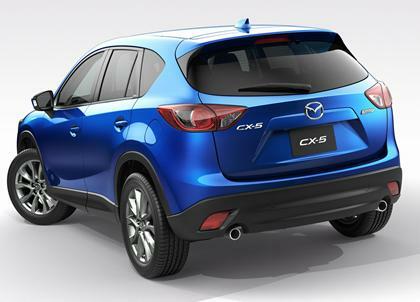 Tribute/CX-5: The crossover ends its current run after the 2006 model year. The Tribute will return in spring 2007, renamed the 2008 CX-5. It will be developed on a re-engineered version of the platform that the Tribute shares with the Ford Escape and the Mercury Mariner. That's pretty interesting, I thought for sure the CX-7 replaced the Tribute in Mazda's lineup. I think the CX-7 above the Tribute; more of a Pilot, Edge, Highlander, and Outlook competitor. The Tribute (CX-5), with it's two rows of seats, will compete with the Rav-4, CR-V, Escape, Equinox. That really doesn't seem to fit in with the rest of their lineup. Could they make it any more of a rebadged escape? Hell the current Tribute looks better than that. Why go into trouble of ending the current Tribute run if they are going to re-release the same damn vehicle a year later? Mazda says its CX-5 small SUV should be in showrooms in February, priced about the same as the Honda CR-V and Ford Escape: roughly $20,000 to $30,000. It'll offer a choice of six-speed automatic or six-speed manual transmission, both gearboxes built on the same assembly line in Japan, which is unusual. It weighs 300 to 500 pounds less than the Mazda CX-7, which has been the brand's smallest SUV. A diesel engine is under development, due in the U.S. in 15 to 18 months, but Mazda wouldn't say which U.S. models would offer it. Hoping to keep things simple and friendly, CX-5 will offer a setup based on one by TomTom, a supplier of aftermarket navis. Chrysler has adopted a system by TomTom rival Garmin, to offer a comfortable, familiar and easy to use look and feel in some recent models. Mazda has a lot riding on this new small crossover. It's new to the segment, and to break in, Mazda takes a different path when it comes to saving gas. The CX-5 is going to get Mazda's fuel-saving Skyactiv technology, a suite of technologies to save gas. One of the key ways is through a higher compression ratio, which allows gas to burn more forcefully, pushing the piston down harder to maximize power. The crossover will produce 155 horsepower, yet will have an expected government gas mileage rating of 26 in the city, 32 on the highway in the front-wheel drive version. To make an impact in a crowded segment, Mazda tried to give the new CX-5 a startling design inspired by nature. "With its Skyactiv underpinnings and best-in-class fuel economy, CX-5 proves that fun needn't be sacrificed for fuel efficiency," Jim O'Sullivan, CEO of Mazda North America, said in a statement. Big fat Meh on this Mazda. I'd take a new CR-V without question. You can't overlook the mileage issue. Once real world figures come in, that may generate some buzz for this CUV. the one thing that I cant understand is how the CR-V can manage a flat floor in the back passenger area since the very first gen, and 15+ yrs later, mfrs like Mazda and Ford still have the tunnel hump running in their passenger cabins. that's a huge difference between a legitimate 5-person vehicle vs a 4+1-in-a-pinch vehicle. I'll take the CX-5 over CR-V mainly because of the 6MT. another factor is the 40/20/40 rear seat - which is no longer in the new CR-V. I don't know if anything has changed since I last looked at them, but while Mazda interiors look great in pics, I've felt like they aren't great in person. The rear end looks weird. The rear looks alright in these pictures. Looks like a Hyundai Tuscon. 8k sold mid Feb to mid March in Japan. Saw it in person and tested the 6MT. It's a great car in terms of design and driving dynamics. I'll get one in 1-2 yrs. If Mazda is still around. Hopefully the CX-5 and Skyactiv technologies will help the company financially sound. it would be a shame to lose a car maker that puts zoom zoom into all of its products. ^^ It's not so much the product as it is the way Mazda does business. The value of the Yen + building cars in Japan will sink them. Cause a part of you, may be most of you, is ready for a zombie apocalypse . That would go great with my MX-5. Minor changes, but I like it. We looked at one a few months ago. Wife drove it & it felt pretty good as a passenger, but she likes the Equinox more. If they bring the interior quality up to Mazda 3 level it's going to be a killer. Nope, this isn’t a mid-life refresh or fancy new trim level, this is the second-generation Mazda CX-5. As in, it’s all-new, inside and out. We know, evolutionary seems like a bit of an understatement here. But then who are we to question Mazda, a company with one of the freshest and universally excellent ranges currently on the market? Given one in four of all its sales are now CX-5s (it’s shifted 1.4m of them in the last four years), sticking to its guns seems entirely reasonable. There are some important tweaks to the dimensions, though, such as wider front and rear tracks and a centre of gravity 10mm lower than before. The A-pillar has been shoved back by 35mm, too, throwing the visual mass more towards the rear, Jaguar F-Pace style, and improving forward visibility for the driver. On the inside, Mazda has resisted the temptation to inflate cabin space, so you get the same 505-litre boot as its predecessor, and perfectly adequate rear passenger room. Where Mazda’s spent its money is on improving comfort with 10 per cent less wind, road and engine noise at a steady 60mph, two-stage reclining rear seats and a new G-Vectoring Control system that divvies up torque based on steering angle to reduce body roll. A 16 per cent improvement in torsional rigidity should make it a smidge sharper to drive, too. Naturally, digital displays play a central role on the redesigned interior. A new head-up display, 4.6-inch screen on the right hand side of the instrument cluster and a central satnav and infotainment screen now placed higher on the dash are all designed to deliver maximum information, with minimum eye movements. Exact UK specs are yet to be finalised, but engine choices will include the SKYACTIV-D 2.2-litre diesel and the defiantly naturally-aspirated SKYACTIV 2.0-litre petrol, both available with either a six-speed manual or six-speed auto, and the option of four-wheel drive. So what’s the verdict readers? A yawn-inducing update, or a case of Mazda listening closely to its customers? You decide. 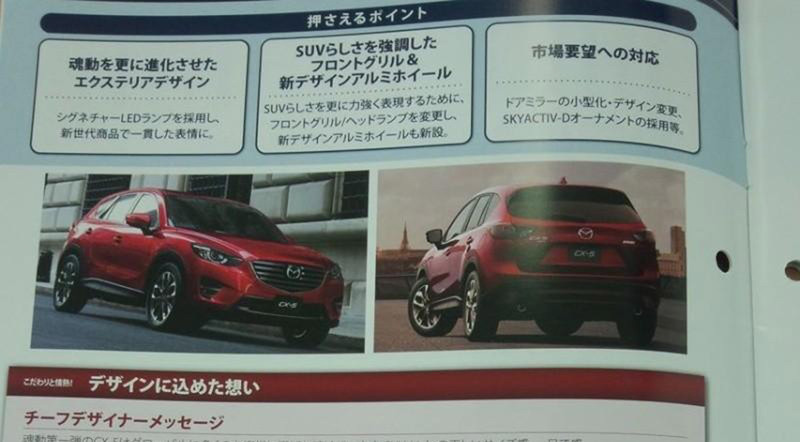 Looks like it gets a CX-3 styled front & a CX-9 styled rear. Not a big departure from the 1G, but still looks good. still in love with these (cx-3 and cx-5) !!!!!!!!!!!!! I looked at the CX3 earlier this year & quite liked how it drove, but it was too small with 2 carseats in the back. Wish they offered a 6MT in it, would be a hoot.